Nowadays, it has become convenient to capture images and videos on the mobile end and associate them with social and contextual metadata such as comments and GPS tags (Xu et al. 2018). Such a hybrid data structure can benefit a wide variety of potential applications on the mobile end, such as location recognition, landmark search, augmented reality, and commercial recommendations (Xu et al. 2017). Current research in Intelligent Sensing addresses the following issues: Intelligent Sensing as a novel methodology for user-centered research; development of new services and applications based on human sensing, computation, and problem solving; engineering of improved Intelligent Sensing platforms including quality control mechanisms; incentive design of work; usage of Participatory Sensing for professional business; and theoretical frameworks for evaluation (Xu et al. 2017a, b, c, d). This is opening a vast space of opportunities to extend the current networks, communications, and computer applications to more pervasive and mobile applications. The submitted manuscripts were reviewed by experts from both academia and industry. After two rounds of reviewing, the highest quality manuscripts were accepted for this special issue. Totally, we have received 22 manuscripts and 14 papers are accepted. 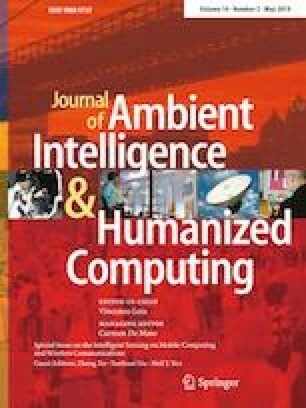 This special issue will publish by Journal of Ambient Intelligence and Humanized Computing as special issues. We also balance the region of accepted papers. Authors are come from China, USA, Sweden, and Tanzania. Wang et al. (2017) propose a low-complexity, partial priori information-sparsity adaptive matching pursuit (PPI-SAMP) algorithm. Unlike the conventional SAMP algorithm, the PPI-SAMP algorithm improves performance over fast-fading channels by adequately exploiting the sparse characteristics and temporal correlation of wireless channels. Focusing on weighted throughput fairness that nodes get throughput proportions according to priority levels in IEEE 802.11e WLANs, Shi et al. (2017) propose an adaptive and full-distributed access mechanism with delta estimation algorithm of traffic loads. Zhang et al. (Yong et al. 2017) proposed a gas leakage source localization algorithm using distributed maximum likelihood estimation method for mobile sensor network to improve the lower performance with static sensor network. In order to achieve higher gains and lower side lobe in antenna design, array antenna is conventionally adopted by Li et al. (Wei et al. 2017). Zheng et al. (2018) present a Parallel Gated Poll (PGP) access mechanism that exploits the PCF defined in the IEEE 802.11. To improve the transmission efficiency of content dissemination, Zhang et al. (2017) propose an efficient caching scheme for ICN, which is named as NCPP-based caching scheme. Chen et al. (2017) regard the signed network as an identical-discrepancy-contrary system employing the set pair theory, and propose a new link prediction measure SNCD which integrates both the certain and uncertain relations, local and global information at the same time. Based on the DSR, the stability of the link is estimated by Yang et al. (2017) using Continuous Hopfield Neural Network to find the route with the highest stability from the source node to the destination node to improve the performance of the DSR and improve the performance of the MANET. Combined with angular domain channel sparsity, compressive sensing (CS) technique is introduced by Wang et al. (2017a, b) to estimate downlink CSI because it can help the frequency division duplex massive MIMO system to overcome the restriction of the limited pilot overhead. Huang et al. (2017) propose novel sub-band spectral centroid weighted wavelet packet Cepstral coefficients (W-WPCC) for robust speech emotion recognition. With the method of alternating-direction-implicit finite-difference time-domain (ADI-FDTD), Wu et al. (2018) discuss the logging response of electromagnetic wave LWD in deviated well. Li and Sugumaran (Li et al. 2018) propose a cognitive-based AES (CAES) model to deal with these issues. It is composed of three parts: sensory acquisition, score analyzer and background knowledge constructor. Zhang et al. (2018a, b) present a new trapdoor function based on “ring learning with errors” problem (Ring-LWE) on lattice, and simultaneously the corresponding efficient inverse algorithm is given which involves two sub-algorithms: the trapdoor inverse algorithm and the iterative inverse algorithm. Zhang et al. (2018) studied the mainstream node load balance technologies and proposed an evaluation model which identifies and measures the level of load. The guest editors would like to thank Prof. Vincenzo Loia who is the editor in chief of Journal of Ambient Intelligence and Humanized Computing. His help and trust is the most important thing for the success of this SI. The guest editors would like to thank the reviewers for their high quality reviews, which provided insightful and constructive feedback to the authors of the papers.